KABUL, Afghanistan — Afghanistan's president spoke with U.S. Secretary of State Mike Pompeo late Tuesday in an apparent bid to reassert his authority as Washington accelerates its negotiations with the Taliban and as separate talks unfold in Moscow without the government's involvement. In his State of the Union speech Tuesday, U.S. President Donald Trump said his administration is holding "constructive talks" with the Taliban and other Afghan groups, and that "as we make progress in these negotiations, we will be able to reduce our troops' presence and focus on counter-terrorism." Last September, the White House appointed Zalmay Khalilzad as a peace envoy tasked with finding a negotiated end to America's longest war, but until now he has been unable to get the Taliban to hold direct talks with Afghan President Ashraf Ghani's government, whom the insurgents routinely refer to as a U.S. puppet. 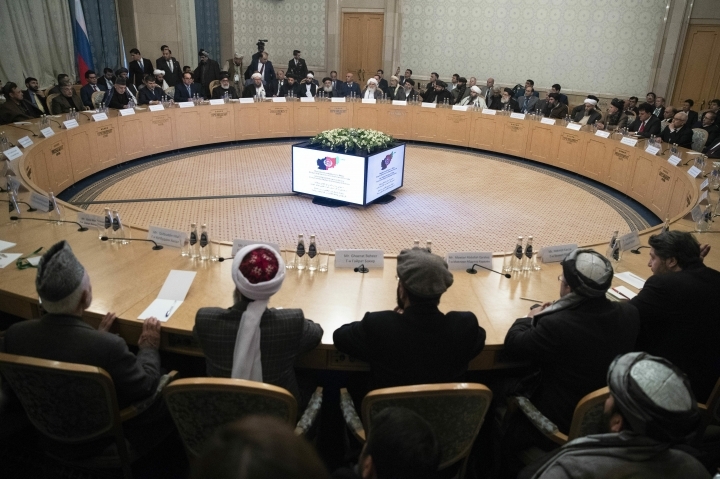 Karzai appeared to try to deflect Ghani's criticism of the Moscow meeting tweeting: "We understand that the government in Kabul needs to be a part of these negotiations. We wish that they would have been here today." Karzai said he was responding to a question from the media in Moscow. The deep divisions within the many stakeholders in Kabul highlight the difficulty of finding a negotiated end to a war that has already cost the United States more than 2,400 lives and $1 trillion. Yet 17 years on, the Taliban control or hold sway in roughly 50 percent of the country and carry out near daily attacks, mostly targeting the country's beleaguered security forces. "We do not know whether we will achieve an agreement — but we do know that after two decades of war, the hour has come to at least try for peace," Trump said in his State of the Union address. Ghani's call to Pompeo seemed an attempt to re-assert his government's role in negotiations he has sharply criticized at times as one-sided. Robert Palladino, deputy spokesman at the State Department, said Pompeo reaffirmed the U.S. commitment to achieving a lasting peace. Pompeo also emphasized the importance of an intra-Afghan dialogue and the role of a cease-fire in ending the violence and making it possible for the Afghan government, other Afghan leaders and the Taliban to negotiate a political settlement, Palladino said. Ghani tweeted that Pompeo "stressed that our military partnership is unwavering and will remain until a lasting and inclusive peace is achieved." Ghani said that Pompeo also "underscored the central importance of ensuring the centrality of the Afghan government in the peace process" and signaled support for holding Afghan presidential elections in July. "We both agreed that words, rumors, and speculations cannot replace actions and that our partnership and resolve will remain strong in the pursuit of peace," Ghani tweeted.